My daughter and I went for a hike on Saturday after being cooped up in the house all day Friday by a rip-roaring southerly storm. The storm lashed us with rain and hail, but in the mountains, it brought snow. Saturday morning, the beech forest at Cragieburn Forest Park was a winter wonderland. Climbing up out of the forest into the alpine areas, the intensity of the storm was clear—thigh-deep drifts filled the path in some places, while other areas had been blown clear down to the scree. Every tussock had a long train of sculpted snow on its leeward side, so you could almost feel the howling wind and the sting of blowing snow, in spite of it being a clear calm day. Nestled among the rocks, we found this lovely whipcord hebe, flowering in spite of its slowly melting blanket of snow. And there were other plants peeking out of the snow, clinging to the scree. 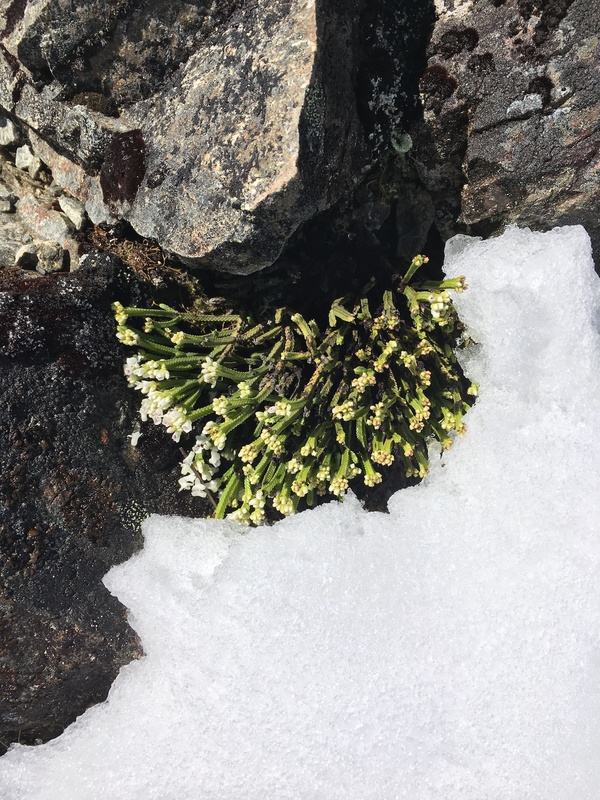 Alpine plants are some of the toughest organisms around. They have to cope with intense sun, wide temperature fluctuations, drought, wind, and ice and snow. They have evolved a variety of adaptations in order to combat these dangers. Short, cushion-shaped growth: A tight ball of branches and leaves resists damage and drying from fierce wind. The pinnacle of this growth form has to be plants in the genus Raoulia. Known as ‘vegetable sheep’, they form hard, tight masses of tightly packed leaves (akin to the texture of a head of cauliflower). Inside the mound, dead plant material builds up around the branches and acts like a sponge, soaking up rain when it’s available. Adventitious roots on the plant’s branches tap into this reservoir of water when the weather is dry. Long roots: Unstable rocks and shifting scree make it difficult for alpine plants to stay put, and water is often far below the surface. To cope, they have long roots that anchor them deep into the rock. Some are also able to regrow from their roots if the top of the plant is snapped of by rockfall. Drought-resistant leaves: Many alpine plants have leaves that are fuzzy on the underside, where the stomates (the breathing holes) are located. The hairs trap a layer of calm air against the leaf surface, slowing down water loss from the stomata. Other plants have narrow, vertically-oriented leaves that minimise exposure to the intense alpine sunshine, reducing evaporation. Sunscreen: A waxy coating on many alpine plant leaves protects against intense sunlight and high temperatures. Antifreeze: Ice crystals forming inside a living cell break the cell walls and kill it, so organisms living in cold environments have to somehow avoid freezing. Alpine plants protect themselves from freezing by manufacturing antifreeze from proteins in their tissues. The antifreeze prevents ice crystals from forming in the plant’s cells. Energy conservation: The growing season in alpine areas is short, and nutrients are scarce. Many alpine plants respond by not reproducing every year. Instead of producing low-quality seeds that may not survive, they hoard resources until they have accumulated enough to reproduce successfully. All these adaptations give most alpine plants a similar look—low, mounded, small-leaved and tough. But one plant in particular stands out as oddly showy and out of place. 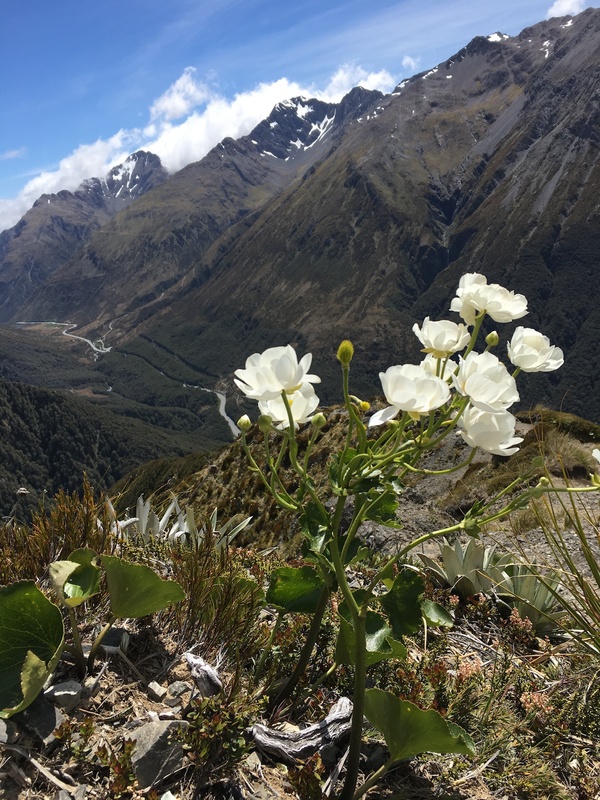 The Mount Cook buttercup (aka Mount Cook lily), is an unusual alpine plant, in that it has big leaves and large, showy flowers. But even so, it is well-adapted to the alpine environment. Most plants have stomates on the underside of their leaves, because the underside is generally shaded and cooler, leading to less water loss. But in the alpine environment, sun-warmed rocks radiate heat, making the underside of the leaves warmer than the upper side on sunny days. The Mount Cook buttercup and its relatives have evolved stomates on the upper side of the leaves, in addition to the ones on the underside. The stomates on the top open when the underside of the leaf grows too warm.